I’ve been a huge fan of Alpine products and have been for years. I love my 4 channel amps and I’ve been enjoying fantastic sound for many years now. Having the flexibility that a 4 channel amp gives is great when it comes time to upgrade your system later. When it comes down to it, you don’t need a super-expensive amplifier to enjoy great sound quality. However, you do need to pick one that’s a well-rounded great choice. I’ll tell you all you might want to know about the MRV-F300 before buying. Read on to learn more. It’s a great looking amp, very compact, and housed in a well-designed dark brushed metal chassis. It feels solid in the hand, but it’s still relatively lightweight compared to conventional older amps of the same power rating. I have owned other amps in the past with the same power rating and they easily weighed 3 times as much as the MRV-F300 does! It measures just under 5 lbs (around 10 kgs). Build quality is great, and I notice there aren’t huge gaps or misaligned parts like on cheaper amps of the same Class D technology. I’ve tested other type D amps before, and easily noticed they weren’t put together well or felt a bit flimsy and just didn’t feel solid. That’s not the case here. The amp looks great and connectors are high-quality. and you can make a very tight and more reliable connection unlike lesser amps with standard screw terminals. Fit and finish is excellent, with no big gaps or sloppy assembly. The blue light on top glows when it is turned on. My opinion so far? NICE! Connectors are very high quality and use hex-keyed screws to securely hold wiring connections. Connectors are clearly labeled, and take the guesswork out of bridging the amp if you choose to do so for more power. The power connectors are circular inside and 8 gauge power wire will fit and is recommended for installation. I really like what Alpine has done with the protective end caps it comes with – unlike amps in the past, they’re easy to get on and off. They snap on and off! If you choose to mount it under a seat in your car or truck they’re great for protecting the wiring from shorts if you happen to have tools or coins lying around in your interior like I do at times. Also, it just plain looks nice with them on! By the way – upon opening the box you’ll find an Alpine Verification Certificate detailing the operation and performance of the amp you bought! Very nice. There are a multitude of Class D car amps on the market today, and most are pretty compact. The problem is that a well-designed car amp with decent power and GOOD quality sound requires a bigger circuit board and more parts – and that means a bigger size. Alpine, for several decades, has been several steps ahead of the lesser brands. They use surface-mount component technology (SMT) to reduce the size required in order to make a smaller and better-sounding amplifier. Measuring only 7 7/8″ W x 6.5″ D x 2 3/16″ H (200 x 165 x 55 mm) it’s crazy small and can fit in creative places that older amps could never even come close to fitting in! That’s a huge advantage! You could even fit one amp under each seat in some cases for a great way to have a multi-amp system that thieves won’t see. Class D amplifiers are one of the most recent developments in the audio world. Unlike conventional Class A/B designs (which most car audio amps still use to this day) that are around 50% efficient, a Class D amplifier uses ultra-fast switching technology to bring efficiency to near 90%! This means since you are no longer wasting huge amounts of power (which turn into heat, by the way) the amp can be reduced greatly in size and doesn’t need a huge power supply internally. However, as I mentioned at the beginning of my review, there’s something you need to know: Class D amps have higher “noise floors”, another name for the baseline noise or “hiss” level you hear when the gain is turned up. 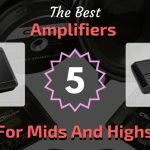 Also these types of amplifiers must be well-designed to ensure the technology use doesn’t modify your music signal (distortion) when amplified. That’s what they’ve done, as Alpine uses their own engineering rather than repackage and relabel a lower-end audio amp like some competitors do. Sound quality is just great as you’d expect from Alpine: music is full and clear, highs are bright and crisp, and bass is solid and easily drives speakers without giving out. It’s an excellent sounding amplifier and a winner! In the past I had my doubts about Class D car amps (after having a few bad experiences) but the MRV-F300 has changed my mind. It’s that good. Bass hits hard and has great impact, just as you’ve come to enjoy from conventionally larger amplifiers. If you’re planning to drive subwoofers with moderate power and volume (up to 150W each) you won’t be disappointed. If you need slamming bass, however, I’d consider the sibling MRV-M500, a mono amp with much more power available in the same size. I have excellent hearing and based on my audio design & listening experience, I can definitely recommend this little powerhouse. The MRV-F300 features full range, low pass, or high pass crossover settings including 50-400Hz adjustable cutoff. A bass EQ (boost) feature is built-in too. The crossover functions are easy to use. Controls and switches have a good, solid “feel” to them. One thing I’ve always noticed about Alpine Electronics is their products use good components that don’t feel sloppy when making adjustment, and don’t change due to vibration after I’ve adjusted them. This amp is no different. Note: the bass EQ boost is works only for the 3/4 channel pair when turned on. I’ve taken off points in my review score at the bottom as this feature in my opinion should be on 1/2 also. One thing you need to know is that because it’s a Class D amp, by nature the noise level can be heard more when the gain is turned up higher. I definitely recommend adjusting the gain to a lower level that will still give adequate volume when the stereo is turned up high. Alpine has done a great job in designing the amp, but it’s one of the trade-offs of this type of amp. Still though, it sounds wonderful and noise levels are basically imperceptible in most cases. The great news is that it’s still easy to install – just like any other car amp as screw mounting is used to mount on tabs on each end of the amp (one pair of tabs on the control end and one pair on the power & speaker connection side. It also works with speaker level inputs so it’s great for factory stereos too! The amp fits great under seats and can still leave room for speaker crossovers! Here’s an example of a custom install using the amp when space is limited. Actually if needed, because of its light weight, in more difficult installations you could even use industrial strength Velcro or some type of reliable double-sided tape to mount it if necessary. The amp won’t heat up and cause the adhesive to lose strength, unlike amps in the past. As I mentioned earlier it looks more professional to use it with the end caps snapped on, but I’ll leave that up to you to decide. Note: because the amplifier’s mounting tabs face inward, it may be a bit hard to install under a seat. Be prepared to use a short screwdriver or even remove the seat to make your job easier when installing. …so you’ll need to remember to pick up whatever else you need before you start your installation, along with an amp wiring kit. I recommend picking up a good quality but great-priced 8 gauge wire kit like this one I found at Amazon. It’s a lot less hassle to be prepared, and you sure don’t want to end up paying too much or having to run out for supplies while in the middle of your install work! For your convenience I’m including the specifications directly from the owner’s manual as well as details I’ve found myself. Front/rear adj. crossovers: Hi/low-pass, 50-500Hz, 12dB/oct. You may have noticed that the signal-to-ratio ratio specified at 1W is lower than typical amplifiers. As I mentioned earlier, that’s an inherent design trait of Class D amps, but in practice with good speakers and the amp being sent a good signal level, it’s not really an issue. I’m still pleased with the sound quality and wouldn’t recommend it if I didn’t feel you would be too. Also note that the EQ boos is +12dB, in case you weren’t aware. That’s a very noticeable amount of bass increase. I love this amp. For the money (it sells for a very reasonable price, usually somewhere close to $150 dollars or so) it’s a great buy. As both an installer and a music lover I’d recommend it to nearly everyone except those who want extremely high signal-to-noise specs. The MRV-F300 doesn’t disappoint as it’s a great performer – and definitely a great value, too! Is it small? It sure is! However, thanks to the superior Alpine design quality both music reproduction and power output are impressive for such a compact size. It's a great performer musically and I love it. While many similarly priced class D amps by nature have a higher noise level than conventional Class A/B amps, Alpine has done a great job in minimizing noise. Music is crisp, loud, and most of all enjoyable. This is an excellent amplifier for both aftermarket or factory stereos - with its small size it can fit safely away under seats or in storage areas. Factory systems gain the additional benefit of an auto-on sensing feature when the speaker level inputs are used. Not only that, but the included snap-on end caps round off a great-looking appearance nicely...and it's priced close to the same as lower-quality competition models. Don't pass this one up! 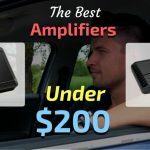 The Best Car Amps Under 200 & 225 Dollars - Five Fantastic Buys! If so, I would like to ask you what are its advantages over the KTP-445u then? It seams that they are pretty similar, plus, you could save time, money and effort in installing. (Takig in account, for a simple use of 4x speakers). Hello, Dror! There are some important differences. But those don’t really apply in your case. As you said it’s for an installation with 4 basic speakers, yes the KTP-445U would be a great choice. What’s the difference between them for an OEM HU with Morel Tempo 2-via midbass and no sub, focused on SQ for classic rock? Hi there, Henrique! I had a look at those amplifiers and I’ll try to answer your question well. First off, it’s important to note that the Solid 4 and the HCP4 are in different design classes (A/B) vs the MRV-F300 and the DPower4 (class D), therefore it’s not always an equal comparison in some ways. – The MRV-F300 is a great mid-point amp that caters to people wanting a good compromise between performance, sound quality, and price. Of the 4 amps, it has the most flexible crossover (aside from the HCP), but no external bass remote option like the Solid 4. However it does offer a bass boost feature like the DPower4 does. – The Solid 4 offers a bit more power (75W x 4 @ 4 Ohms) but it’s class A/B, so it’s not as efficient as the Dpower4 and F300 and will require a larger power wire and will run warmer. The “pro” is that class A/B amps like this one have a bit better signal-to-noise ratio (SNR) than class D models. – I don’t see much that really catches my eye about the DPower4, except for 10W per channel more than the F300 and a few minor things. 1. For your setup if you must have the absolute best SNR and lowest distortion in that price range, the Focal Solid 4 is likely the best choice for you. If you later change your system to use a subwoofer the included remote is a nice thing to have. 2. 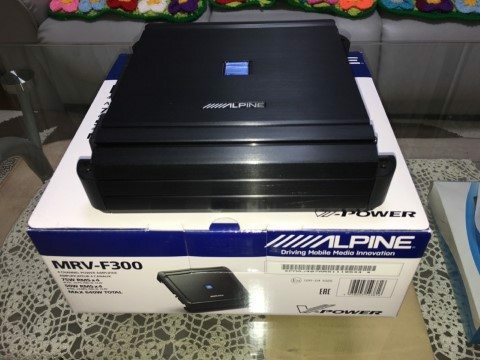 If you’re ok with a class D amp, hands down personally I’d recommend the Alpine MRV-F300. It has lots of great feedback from many owners as well. It’s a great sounding amp for the money and should do well for all but the most discriminating listener. The Hertz and Focal brands aren’t some of the more common ones in the USA, so it’s harder to judge what to expect, given that there’s not much in terms of buyer reviews. I’m sure they’re probably well-made, but I won’t recommend personally to American buyers as I can’t vouch for them. I really like how the Alpine looks when installed. The end caps make for a great installation, especially a custom one, and my customers like it, too. Many people really like getting that sleek look without having to spend a lot more money. If you like the MRV-F300, then having 2 amps for great classic rock sound by using the MRV-F300 for your component speakers and the MRV-M500, etc., for a nice sealed subwoofer would be a great idea. Thanks for the great and detailed review Marty!! !I was wondering about your opinion between Alpine MRV F300 and Focal FD4.350 and FDS4.350. Hi Niko and thanks for the question & comment! The Focal amps cost more than twice the Alpine (around $400) despite pretty similar power ratings. I can’t find any features or anything that really stands out about the Focal amps to justify choosing those. While the Focal may be listed as 58W x 4 @ 4 ohms and the Alpine at 50W x 4 @ 4 ohms, I’m pretty confident the Alpine will actually exceed its rated power. For my money, I’d easily choose the MRV-F300. Thanks for your reply Marty! !Do you know the year that MRV-F300 was first released in the market? Hi Nikos. Yes, I believe it was 2014. It’s getting great reviews and still a very nice contender on the market, despite there being more competition now. And what about the MRX line?What’s your opinion?? Well, the MRX are excellent, but a bit harder to find now as they’re older models. Those are a higher-performance line and if you’re a sound quality enthusiast and want the best specs you can get, they’re ideal. The MRVs are good, but not high-end/higher-performance amps like the MRX & PDR series. The PDR series are really nice, are still available, and have excellent specs (especially the SNR noise rating and much more). Of course the MRX & PDR will cost a fair amount more than the MRV-F300, as you’d expect. 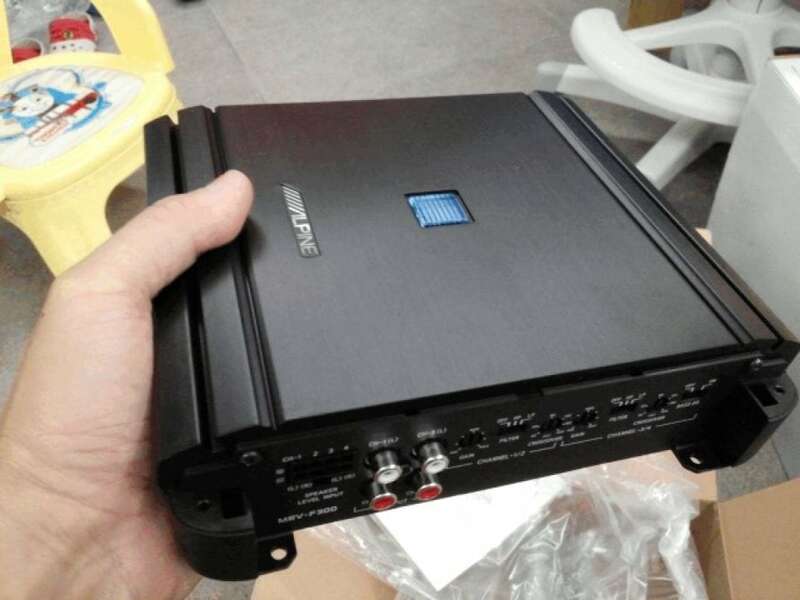 A great one that can be found for under $300 if you shop smart is the Alpine PDR-F50 85W x 4 @ 4 ohms 4 channel amp seen here. I wouldn’t say that I am looking for super high sound quality! !Currently I have a ”Joying” 2 din android source.So it doesn’t have much quality in sound output.So I am looking for a decent 4ch amplifier to feed my splitted Peerless speakers.I also intend to insulate all my 4 doors and get rid of my 5ch Signat amplifier and the small Vibe subwoofer that I have in my trunk. Ok, understood. It sounds like the MRV-F300 is a great choice for you then! After reading your review for this amp, you have me considering trying to replace my NVX JAD800.4. I’m running Alpine SPR-69’s in the front doors, SPR-10TW’s in the dash, and SPR-60’s in the rear doors. I was initially looking at this amp at the time, but the power output seems too low for my speakers. I ended up getting the NVX because of the substantially higher power output, available options, and were very close in price at the time. This amp gets loud, but doesn’t have that oomph I was expecting. Do you think it’s worth trying to swap it out? Hi Ken. The NVX should be more than capable of driving your current setup up very well, given the proven power ratings. The power output for your amp is far and above what is needed for the speakers you have. If you’re not getting the volume and/or dynamic sound you like, replacing it with the MRV-F300 won’t help either. You don’t mention what head unit you’re using, but it sounds like perhaps you’re using one with a low output signal strength. Additionally when you say “oomph”, if you’re referring to a lack of bass, that’s often installation related. – Be sure you’re running the front and rear speakers with the high-pass crossover on the amp, set to say 50Hz or so. This will allow high volume without bottoming out or hitting a distortion levels early due to heavy bass. – If there’s a lack of bass in the front & rear speakers, you may need to look into using baffles on the speakers and sealing open areas that affect bass response. – ★ I would mainly try a better signal source and see what happens. If the signal from a head unit is very low and the amp’s gain has to be turned up really high to compensate you won’t get the same range of volume as a better head unit would allow. For example, using the MRV-F300 (or other amps) and a great signal source (4V output) I got excellent volume in testing. My advice would to be look further into what’s giving you these disappointing results before spending money on another amp. If you can’t find the issue I’d recommend asking a trustworthy, reputable shop to take a look. I have a question with the speakers that I could use. Which would be the best speakers (front & rear) for the amp, keeping in mind reasonable price and size 6.5. Hi Juan & I’m glad you liked the review. It’s a pretty nice sounding amp! If at all possible, I’d recommend you use some nice (but affordable) 6.5″ components speakers like these from CT Sounds. They have some coaxial models as well. Otherwise, you might also consider some from Polk, too, if the price is right. There are many good speakers, but I’d start by having a look at those. Hi Tony! Yes, you can run 4 speakers in parallel (2 ohms each channel) on 1 & 2 and 1 midwoofer each on channels 3 & 4 if you like. Personally I think you would better enjoy adding a 2nd MRV-F300 to drive the 2nd set of speakers + channels 3/4 bridged to drive a subwoofer as well. That way you’ll have plenty of power for all main speakers + nice bass, too. Thanks for your in depth review. I have a 2011 Forester plan on keeping the Clarion head unit which also has HD feature that I like. 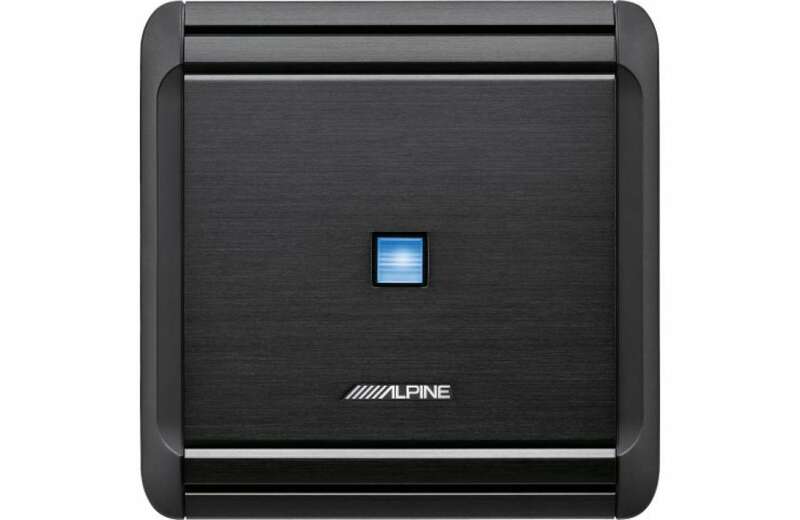 I was thinking of going with a Alpine amp either the MRV-F300, PDF-50 [Edit: should be PDR-F50], or KTP-445U. I was planing on using four Alpine SPS-610. The tweeters are OEM in the front pillar which I was going to leave alone. Now you mention CT speakers. Never heard of them. I listen to classic rock. What would you recommend? I appreciate your opinion. Hi John and thanks for dropping by. I wouldn’t recommend the KTP-445U, unless for some reason space is very tight your Forester. The MRV-F300 is a great value right now and will deliver more power along with much more flexible crossover controls since you should have the room. And definitely, the PDR-F50 is an excellent choice mainly for sound quality that’s even better but with the benefit of more power to work with. If you really want to use coaxials like the Alpine SPS-610s, that’s fine, but understand you’ll lose sound performance as you’ll be giving up separately mounted tweeters with better crossovers like the CT Sounds provides (or similar component speakers). From your comment about the pillar mounts I assume you’re not interested in that so I’ll skip that topic for now. 1. The excellent Alpine PDR-F50 and the inexpensive but great-sounding MRV-F300 are recommended over the KTP-445U for your situation. Note: Both the PRD-F50 and MRV-F300 will work with the factory speaker-level outputs. 2. The Alpine SRS610 is definitely a nice set and a good idea, but also have a look at the Polk DB652 6.5″ pair while they last. 3. You might also consider adding an inexpensive subwoofer as it really add a lot of enjoyment for bass drums and more. Check out the MRV-F300’s sibling the powerful & compact MRV-M500 mono bass amp. It’s a nice, affordable choice too. 4. If adding a subwoofer, a simple single 10″, 12″, or even an 8″ in a sealed box would sound nice. That’s how I enjoyed my rock for years! (a.) Alternatively you could bridge the rear 2 amp channels for a subwoofer and get enough power for pretty good everyday bass. I hope this helps! Best regards.